VATICAN CITY (CNS) — A nation’s health-care system cannot be run simply as a business because human lives are at stake, Pope Francis said. “If there is a sector in which the ‘throwaway culture’ demonstrates its most painful consequences, it is the health-care sector,” the pope told patients, medical professionals, pastors and volunteers attending a meeting sponsored by the Italian bishops’ national office for health-care ministry. 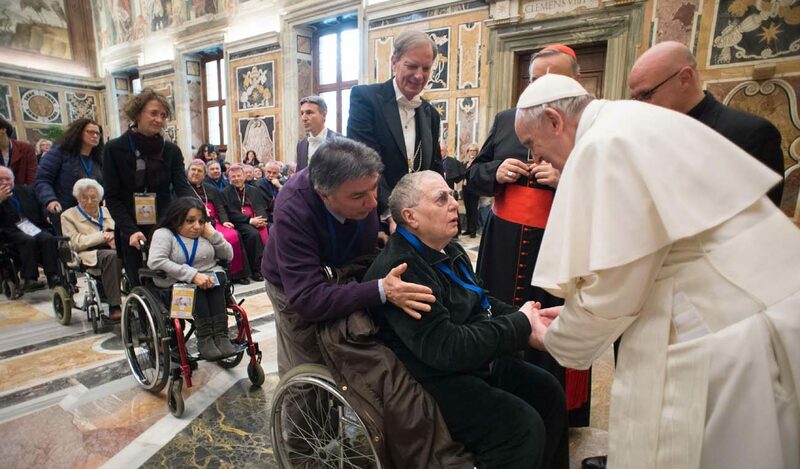 Anticipating the celebration Feb. 12 of the World Day of the Sick and marking the 20th anniversary of the bishops’ office, the pope said Catholics obviously give thanks for the advances in medicine and technology that have enabled doctors to cure or provide better care for the sick. He also praised medical personnel who carry out their work as “ministers of life and participants in the affectionate love of God the creator. Each day their hands touch the suffering body of Christ, and this is a great honor and a great responsibility,” he said.